On the night of September 19, 1863, when the first day of bloody fighting had ended, the two armies re-grouped and planned their strategy for the next day. 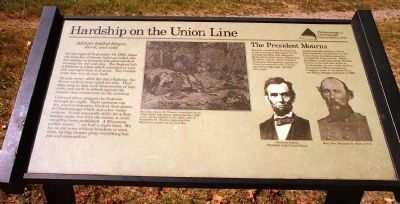 The Federal left withdrew to a line which extended to your left and right from this point. The Confederate line was at your back. Already weary after the day's fighting, the Union soldiers here could not rest. Their axes rang as they built breastworks of logs, rails, and earth to defend against the attacks that would come in the morning. Cold and thirst plagued the Federals through the night. Their canteens ran dry, and Confederates blocked their access to Chickamauga Creek and other water sources. It was unusually chilly for a September night, but with the enemy so near, campfires were prohibited. A Wisconsin soldier wrote: "... we had a slight frost. We lay on our arms without blankets or even coats, having thrown away everything but gun and ammunition." Thomas, commander of the Union 14th Corps, sleeps behind the lines with a tree root for a pillow on the chilly night of September 19. President Abraham Lincoln. Helm had been leading his Kentuckians against the Union breastworks when a bullet pierced his right side. He died that night. Lincoln had offered Helm, a West Point graduate, a commission in the Union Army, but Helm joined the Confederate Army instead, When President Lincoln learned his favored brother-in-law had been killed at Chickamauga, he was visibly stricken. It is said that Helm's death hurt Lincoln as much as the death of his son Willie, stricken with fever in 1862. 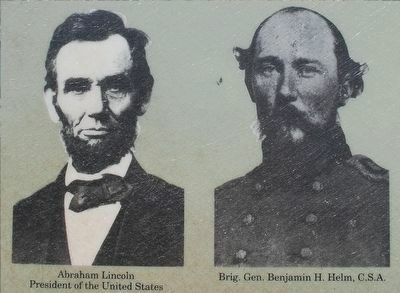 This section includes photographs of Abraham Lincoln, President of the United States, and Brig. Gen. Benjamin H. Helm, C.S.A. Erected by Chickamauga and Chattanooga National Military Park. Location. 34° 56.003′ N, 85° 15.325′ W. Marker is near Fort Oglethorpe, Georgia, in Catoosa County. Marker is at the intersection of Battleline Road and Alexander Bridge Road, on the right when traveling south on Battleline Road. Touch for map. 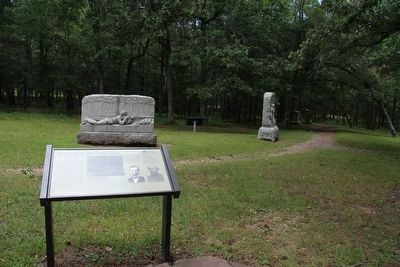 Marker is at a pulloff with several markers and monuments. It is directly in front of the 15th U.S. Infantry Monument. It is Stop 2 of the 7-mile 8-stop National Park Service Driving Tour. Marker is in this post office area: Fort Oglethorpe GA 30742, United States of America. Touch for directions. 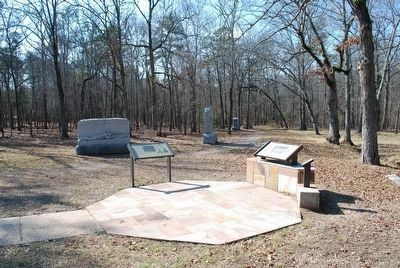 (a few steps from this marker); The Second Day Begins (a few steps from this marker); 18th United States Infantry (a few steps from this marker); 16th United States Infantry (a few steps from this marker); 48th Tennessee Infantry (a few steps from this marker); J. King's Brigade (a few steps from this marker); 10th Wisconsin Infantry (a few steps from this marker). Touch for a list and map of all markers in Fort Oglethorpe. More about this marker. 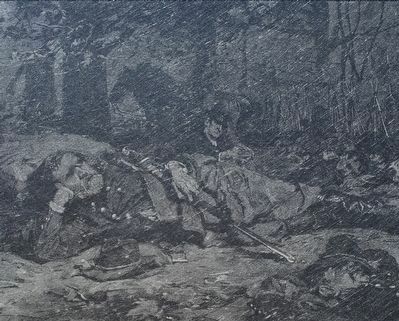 Center Drawing: The marker includes a drawing captioned: Maj. Gen. George H, Thomas, commander of the Union 14th Corps, sleeps behind the lines with a tree root for a pillow on the chilly night of September 19. Historic engraving from Battles and Leaders of the Civil War. 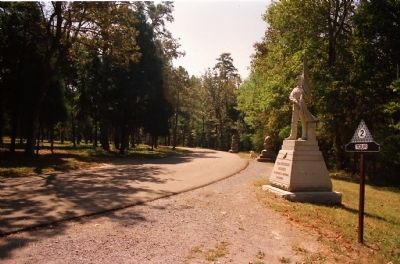 View of the marker looking west along a park walking trail. View looking south on Battleline Road. The marker is at a pulloff to the right. More. Search the internet for Hardship on the Union Line. Credits. This page was last revised on June 16, 2016. This page originally submitted on January 30, 2013, by David Graff of Halifax, Nova Scotia. This page has been viewed 424 times since then and 10 times this year. Photos: 1. submitted on January 30, 2013, by David Graff of Halifax, Nova Scotia. 2, 3. submitted on August 19, 2015, by Brandon Fletcher of Chattanooga, Tennessee. 4. submitted on August 19, 2015, by Dale K. Benington of Toledo, Ohio. 5. submitted on August 19, 2015, by Brandon Fletcher of Chattanooga, Tennessee. 6. submitted on January 30, 2013, by David Graff of Halifax, Nova Scotia. • Craig Swain was the editor who published this page.